Congratulations to Mark Anderson, winner of the 2017 Bob Trojan “Making It Loud” Award. This award honors an individual or community organization who has worked to promote FIRST Robotics programs. 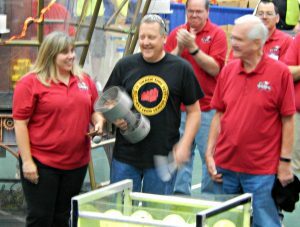 Mark has dedicated countless hours over many years to supporting FIRST Lego League in the Rick River Valley. Starting as an FLL coach of both home and school based teams and progressing on to organizing and running FLL regional competitions. When FLL expanded in our community and outgrew one regional competition, he didn’t hesitate at hosting two Regionals each season on two different weekends providing hundreds of local youth the opportunity to show their skills to their friends, families and our community.